Air Astana, Kazakhstan’s largest carrier, has taken delivery of its second Airbus A321neo aircraft. The June 2-delivered aircraft offers 179 seats in a two-class configuration (business 28/economy 151). 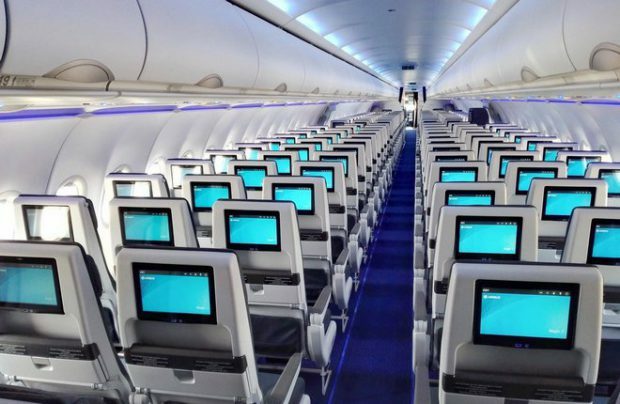 As with its first A321neo, this latest aircraft is also equipped with an in-seat inflight entertainment system. The Pratt&Whitney PW1100G-powered aircraft (registration number P4-KDD) will be operated on Air Astana’s domestic and international routes including flights to Russia, Georgia, Turkey, the UAE, central Asia and China. In total, the airline has ordered 17 A320neo-family aircraft, with the first A320neo and two A321neo already delivered. The remaining 14 are to be delivered within the next two years. The carrier’s total outstanding aircraft order is now at 22 units – apart from the 14 A320neo family aircraft, there are also five Embraer E2s, and three Boeing 787s in the pipeline. This latest fleet expansion coincides with the enhancement of the airline’s network. The Kazakh flag carrier is launching new flights from Astana to the Russian destinations of Tyumen and Kazan. The three-times-a-week Tyumen service, which opened on 2nd June, is being served by an Embraer E190 offering nine business and 88 economy class seats. Astana-Kazan, the second new route, which commenced on 3rd June, is a weekly service operated by an Airbus A320 and an Embraer E190 aircraft, with the frequency to be increased to three a week later in the year. The new service supplements the existing Almaty-Kazan flight, which operates twice a week. The summer schedule will see Air Astana serving 30 cities in 21 countries, including 13 cities in five CIS countries. The domestic network covers 12 cities across Kazakhstan.